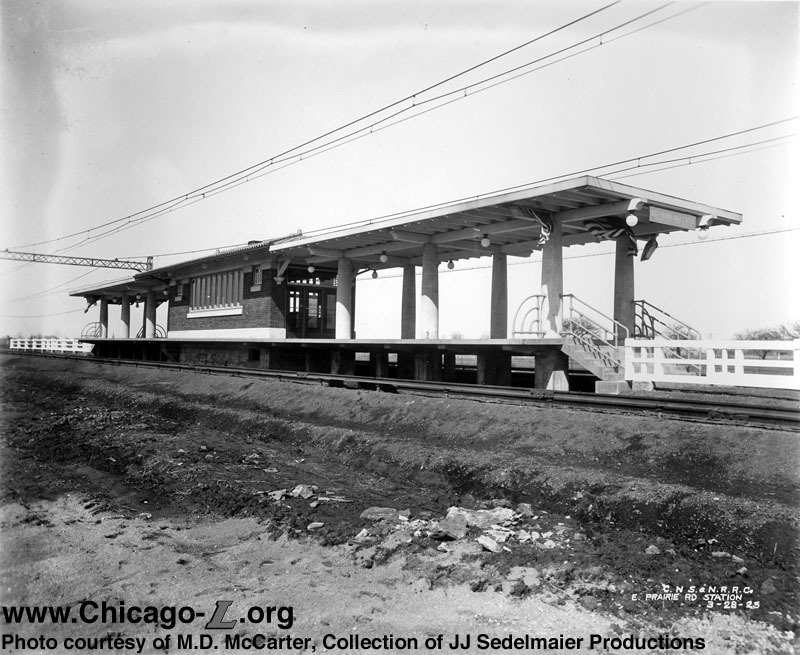 Crawford-East Prairie station was built as part of the Chicago, North Shore & Milwaukee Railroad's Skokie Valley Route, a high-speed bypass for the interurban around the more congested North Shore suburbs. The North Shore Line never used this stop, however -- though built as part of the Skokie Valley Route project, it was intended as a local stop for "L" trains. The Chicago Rapid Transit Company (CRT), owner and operator of the "L" at the time, had trackage rights on the line and operated local service to intermediate stations between Howard and Dempster, including Crawford-East Prairie. Both the North Shore Line and CRT were owned by utilities magnate Samuel Insull. Arthur U. Gerber, staff architect for Sam Insull, designed the facility. 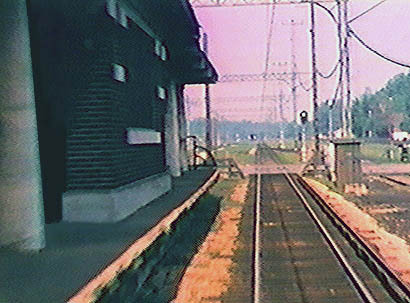 Nearly identical to the other local ground-level stations on the Niles Center branch between Main and Crawford-East Prairie (inclusive), Crawford-East Prairie was also similar to the still-extant Dempster station at the end of the line, only smaller and set between the tracks with a single high-level island platform. The arrangement of the Crawford-East Prairie station was unique among the ground-level stations on the Niles Center branch. While the others had a station house situated near the street with a porch on the front and a platform projecting from the rear, Crawford-East Prairie station straddled its two namesake streets. However, Crawford Avenue and East Prairie Road are only a little more than 350 feet apart here, making it impractical to fit a station house at each end and sufficient platform length in the middle. 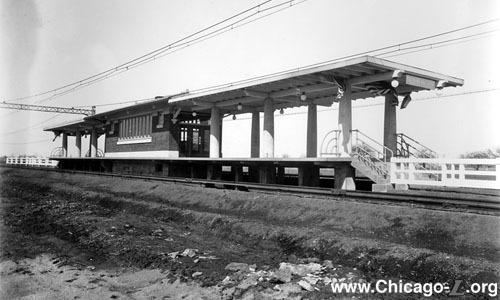 Instead, the facility was designed with the station house in the middle and the platform surrounding the building. 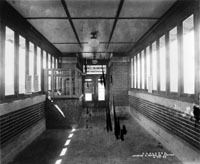 The front porch and rear boarding platform found at the other stations were here melded into a combined space that functioned as both, and which were located at both ends of the station house. The platform also continued around the sides of the station house to create a continuos boarding area. Stairs were located at each end of the platform providing access from both streets via a fenced-in walkway. This essentially put the responsibility on the passenger to walk down the platform to the station house to pay a fare before going back out onto the platform, rather than the more typical station arrangement wherein passengers had to pass through the station house and fare controls before accessing the platform. In practice, however, there was relatively little ticket agent coverage at the Niles Center local stops, with most fare collection being performed by the conductors about the trains. The Crawford-East Prairie station's architecture was an interesting mix of styles. While the building could be classified as Prairie School based on its intricate eaves and bracket work, low-pitched roof, multi-paned casement windows and strong horizontal lines, closer examination of the structure indicates that elements such as its textured exterior brickwork and elaborately bracketed eaves with exposed rafters more closely classify the building as belonging to the bungalow vernacular style, a building type popular at the time with residential development at the time but rarely seen in rail stations. The exterior of the station house was executed in dark textured brick with a foundation, belt course (through the windows) and plain slip windowsills of light cast stone. The windows along the side elevations had a typically Prairie School design, with a long band of ten tall, narrow, vertical casement windows flanked on the ends by smaller square nine-paned windows. The station house had a low-pitched hipped roof with overhanging eaves on all sides. Projecting from each end was a flat sheltering canopy covering the island platform, supported by wooden rafters held up by two rows of tapered cement columns. Exposed rafters and wooden brackets under the eaves filled out the exterior decoration and a signature Gerber touch included globe lamps under the eaves. The interior was small, simple and open, but still quite attractive. It included a floor, brick walls with cast stone sills, and wooden moldings. The modest interior functioned as a waiting room. At the west end of the interior, at the southwest corner of the space, was a wooden ticket agents' booth. Another unique aspect of the Crawford-East Prairie station was how it was identified on the exterior. All of the stations on the ground-level portion of the Niles Center branch had a sign hung under the porch canopy at the front entranceway with the name of the station followed by "CHICAGO RAPID TRANSIT COMPANY". At Crawford-East Prairie station, the signs were located both end ends, under the ends of the canopy. However, the signs identified the station by the name of the street the passenger was accessing the station from -- the sign at the west end of the canopy said "CRAWFORD AVENUE STATION" while the sign at the east end identified it as "EAST PRAIRIE ROAD STATION" -- but they were, in fact, referring to the same station. The same text was painted on the transom over the door to the station house facing each direction. Since the signs were meant to identify the station, not what street the passenger was going to or coming from, it is unclear why the CRT designed the signs this way. As such, the station is commonly referred to using both street names. 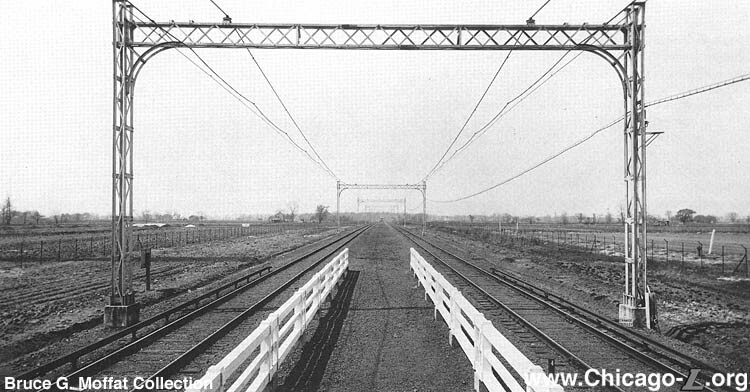 The Niles Center branch and Crawford-East Prairie station opened for service on on March 28, 1925. The station's history over the next couple decades was fairly unremarkable. Within just a few years of the opening of the Skokie Valley Route and the CRT's Niles Center local service the Depression hit. New construction in the suburb virtually halted. The land around the Crawford-East Prairie station was virtually deserted -- though it had been subdivided with roads and sidewalks laid out and utilities installed, there were few buyers and little construction. By the time the Chicago Transit Authority took over in 1947, the Niles Center branch's prospects for high (or even respectable) ridership levels were still dim. The hoped-for development of Niles Center was squelched by the Depression just a few years after the line opened, and remained unfeasible through World War II. 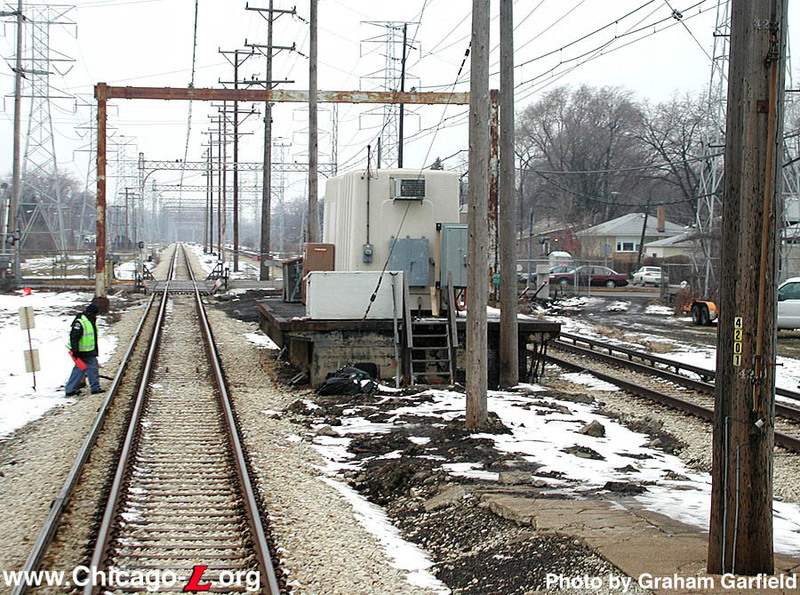 After assuming operation of the "L" system, the CTA studied each rapid transit line and monitored each station. Then, bit by bit, they closed the stations and lines that were most uneconomical and had the lowest ridership to concentrate on the stronger routes. The Niles Center branch fell victim to this systematic pruning when on March 27, 1948, service between Howard and Dempster was replaced by the #97 Skokie bus route. 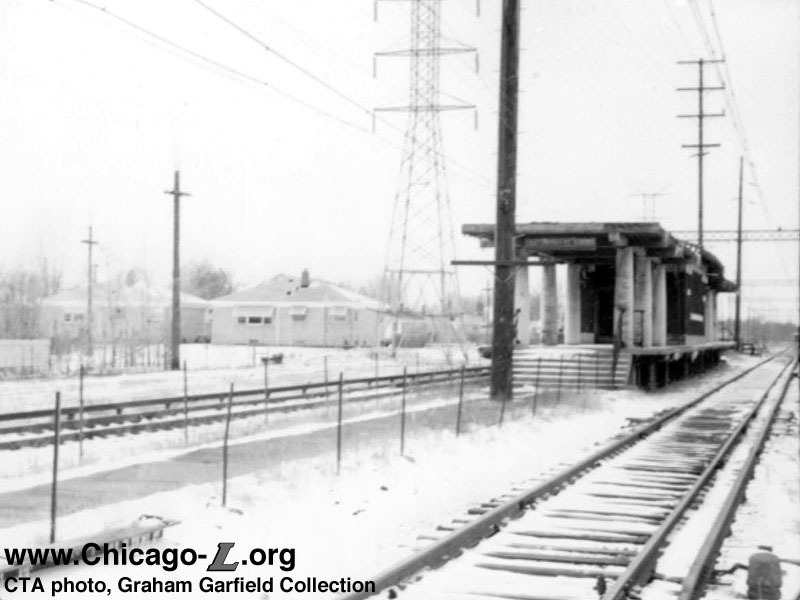 This date was chosen in large part because it so happened that the North Shore Line's employees went on strike on this date -- one of several NSL strikes of the 1940s -- meaning that the Skokie Valley Route was not staffed, preventing the Niles Center branch from operating. Service had to be suspended on the branch due to the North Shore Line strike anyway, so it was a convenient opportunity served to drop a service that was marginal at best. The North Shore Line continued to operate on the Skokie Valley Route but did not provide service to Crawford-East Prairie station, which remained shuttered and abandoned. The Chicago North Shore and Milwaukee Railroad ceased operation in the early morning hours of January 21, 1963. In 1963, following North Shore Line abandonment, the CTA began work to convert the Skokie Valley Line as far north as Dempster to a new rapid transit line. The Transit Authority planned to resume "L" service over the line, though rather than a local branch service it was envisioned as a nonstop shuttle between Dempster and Howard. The "Skokie Swift", as it was dubbed, opened to the public on Monday, April 20, 1964. However , when the Skokie Swift was inaugurated in 1964, no station was established on this site, despite the fact that the area had developed with residential construction, like much of Skokie, thanks to postwar baby boomers. 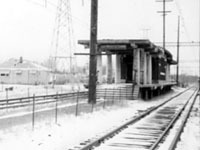 The station torn down in 1964, due to the building's close proximity to Crawford Avenue and East Prairie Road representing a visual obstruction of autos and pedestrians for the motormen of Skokie Swift trains, which flew through the crossing at high speed on their nonstop run. The platform's concrete supports, as well as part of the platform now used for storage, are still visible at the site.